In the tradition of their Puritan ancestors, Evelina and her family did not celebrate Easter. No hidden eggs or little bunnies or even new bonnets appeared in the Unitarian homes of Easton on Easter Sunday, 1852. Many of the Catholic families in town, however, would have celebrated this significant Christian holiday, further underscoring the strong cultural differences between the new Irish and the old Yankees of Massachusetts. Other parts of the country celebrated this holiest of Christian remembrances. 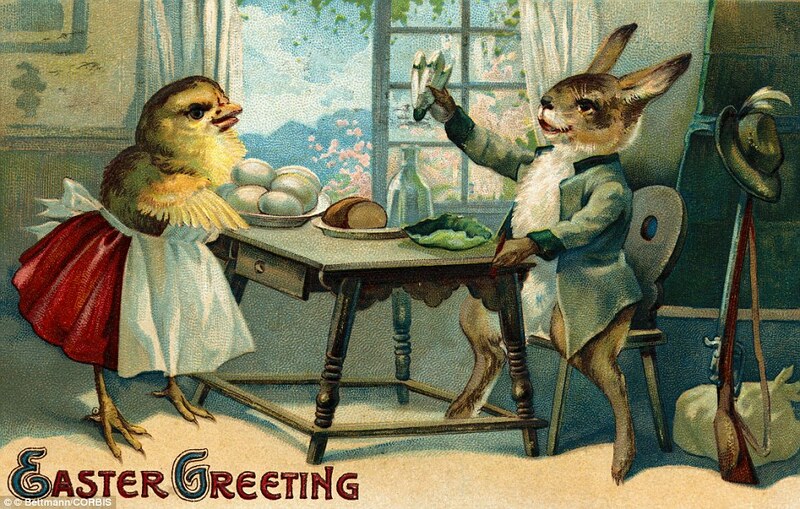 It was the German community of the mid-Atlantic states, better known as the Pennsylvania Dutch who, some say, introduced the Easter bunny to America in the 1700s. The rabbit and the egg were symbols of the Germanic fertility goddess Eostre, whose pagan festival was eventually taken over by early Christians as a celebration of Christ’s death and resurrection. It being Sunday, the Ameses went to meeting, at least, for both an afternoon and a morning service. Reverend Whitwell, the usual minister, was replaced today by Mr. Whitman from East Bridgewater who was, unfortunately, “very dull.” Evelina struggled to stay awake. Love these tales about the Ames family and the meandering path of the Unitarians in Easton. I would add a further note, that Oliver (3), the future Governor, suggested in his 1857 diary that Mr. Whitwell was invited to resign, if that’s the way to phrase it. He doesn’t suggest why. The pulpit was then supplied, I think, by George Withington and various itinerant preachers, until the advent of William Chaffin. Chaffin stayed in place for a long time, as we know, although Oliver Ames Jr., in his diaries from the late 1860s and early 1870s, found Chaffin dull. Thank goodness Chaffin stayed, however, for his writings have greatly enhanced our understanding of life in Easton during this interesting period.